salvation | In Domino Spera! Ps 63 R/. My soul thirsts for you, O Lord my God. That’s why, whenever you enter a Catholic church, a crucifix is the focus of your field of vision (or at least it should be). So why an image of this cruel day, of this moment of torture, pain and death? Why not just an empty cross, clean and elegant? Well to put it simply: it’s not the Cross that saves us; it’s Christ! So then, why not an image of the risen Christ? Because it’s by His Death on the Cross that Jesus saves us, a Death He freely accepted. The Cross is His throne of glory! And so a Crucifix is a statement of faith, a proclamation of the divinity of Christ Jesus. This is made clear in today’s Gospel reading, for as soon as Peter makes the confession of faith that Jesus is the Christ, the Anointed One of God, Jesus begin to talk about His upcoming Passion and Death. And not just any kind of death: but specifically the Cross. The man who never sinned, the man who didn’t deserve to die, was to die a most horrible and humiliating death. And Jesus knew this was to happen; He knew this was His mission. And it’s this very Passion and Death, along with His Resurrection, that we celebrate on the Altar at every Mass. And the Crucifix is there to remind us of that one sacrifice and of our participation in it. That’s why we gather and celebrate Mass facing the Crucifix; ideally I, too, would be facing it with you, when celebrating, offering with Christ His sacrifice of praise, thanksgiving and worship. But it’s not just for this reason. In today’s Gospel, as He predicts His own Passion, Jesus also tells us that we, His disciples, must also share in His Passion, because, as St. Paul tells us in the second reading today, as many of you as were baptized into Christ have clothed yourselves with Christ (Gal 3:27). We’ve been joined to Him by this wonderful Sacrament; therefore we, too, must take up our cross (Lk 9:23). We must follow in the footsteps of our Lord, offering ourselves to the Father, growing in discipline and virtue through self-denial, bearing patiently with suffering and persecutions, all the while remaining faithful to the Father’s love for us. This is the only way to Heaven: the way of the Cross. And no one said this would be easy! That’s why elsewhere in the Gospel Jesus refers to it as the narrow gate (Mt 7:13). But that’s why Jesus spent so much time in prayer, to show us how to do it, and that we cannot do it without Him. So we, too, must spend much time in prayer —everyday —, asking the Father to give us the grace to persevere; asking Jesus to forgive us our sins and strengthen us with His grace; asking the Holy Spirit for wisdom; and asking blessed Mary to comfort us along the way. But it’s also why we journey as a community, because we’re not alone in carrying our cross. Just as Jesus had the help of Simon of Cyrene, so, too, we have each other to help us along the way. So it’s okay to ask each other for prayers and for help; it’s okay to offer someone a shoulder to cry one; it’s okay to speak of our struggles and ask for advice. In fact, it’s necessary for us to do these things! This isn’t always easy, and it makes us very vulnerable, but this is how we grow closer to Christ and to each other; this is how we become a community in the true sense of the word: a group of people united to each other in truth, in faith, and in love. This is the way of the Cross; this is the way to Christ. Jesus isn’t some mere prophet, teacher or leader; He is the Son of God, our Lord and our Saviour. He gave His life for us while we were yet sinners (Rom 5:8), and He invites us to give Him our lives in return. Through His grace, may we have the courage and the faith to embrace the Cross He shares with us for our salvation. Amen. Ps 47 R/. God has gone up with a shout, the Lord with the sound of a trumpet. Today we celebrate the Solemnity of the Ascension of the Lord, one of the five great feasts of the life of Jesus. In many parts of the world, this Solemnity was celebrated this past Thursday, the 40th day after the Resurrection, the actual day on which the Lord ascended into Heaven. When this feast is celebrated on Thursday, it’s a holy day of obligation — this speaks to its importance in the life of the Church. In many other parts, like in Canada, we move this Solemnity to the following Sunday. This was done in an attempt to make it easier for people to attend Mass on this feast. While it may have made it easier for people to celebrate this feast, it’s also regrettably obscured its importance. Since it falls on a Sunday, it seems we barely take notice of it. But the Ascension of the Lord is a significant moment in the life of the Church! Our first reading today, describing the event of Jesus’ Ascension, helps us to see why. As I’ve mentioned before, repetition is always a call to pay attention. In these eleven verses, Luke uses repetition to call our attention to several key themes, but today I want to focus on just two of them: the Kingdom (vv. 3, 7); and, the Holy Spirit (vv. 2, 5, 8). The ‘Kingdom of God’ was a major theme in the preaching ministry of Jesus. He often spoke of the ‘coming of the Kingdom’ or of the presence of the Kingdom. This was related to the ancient expectation Israel had for a Messiah King who would deliver it from its enemies and rebuild the kingdom of David. This expectation is explicit in today’s verse 6, Lord, is this the time when you will restore the kingdom to Israel? (Acts 1:6). But this notion of a kingdom is more than just a political reality. For the Jewish mind, it included the reunification of the Twelve Tribes of Israel, who had long been divided and scattered (cf. Sir 48:10; Jer 50:19-20; Hos 11:11; Lk 22:30; Acts 26:6-7). It also carried with it the hope that all God’s people would once again be gathered together under His Name and under His sovereignty. However, as we know, Jesus spoke of a Kingdom that was much different than a political reality. While Jesus’ Kingdom embodied the aspects unity and Divine Sovereignty, its deliverance wasn’t in regards to political powers like Rome or the gentiles, but rather in regards to sin and death. This we discover more clearly through the Passion and Resurrection. That’s why Jesus spoke of His Kingdom as not being of this world (Jn 18:36). This is why the Ascension is necessarily tied to the Solemnity of Pentecost, which we’ll celebrate next Sunday. And Luke makes this link clear in today’s reading: you will be baptized with the Holy Spirit not many days from now (v. 5). Jesus’ bodily Ascension to the Father is so that He might bestow on His disciples the gift of divine Life, which is the Holy Spirit (cf. Nicene Creed). It’s precisely through the outpouring of the Holy Spirit that Christ will unite His Kingdom, and not just the Tribes of Israel, but all peoples, together as one in His Name, in His Spirit, in His Kingdom, which we call the Church. Luke mentions this explicitly in our Gospel today, repentance and forgiveness of sins is to be proclaimed in his name to all nations (Lk 24:47); and in the first reading, too: You will be my witnesses in Jerusalem, in all Judea and Samaria, and to the ends of the earth (Acts 1:8). And so, my brothers and sisters, to proclaim repentance and forgiveness of sins is the mission of the Church — of all the disciples of Jesus —, until the Kingdom of God is spread throughout the earth and all nations proclaim His Name. Because the great desire of the King is that none should be lost, but that all might be one in Him as He is in the Father (cf. Jn 6:39; 1 Tim 2:4; 2 Pt 3:9; Jn 17:20ff). Again, this is why He has sent us the Spirit of unity. In the mystery of the Ascension, Jesus has not abandoned us or left us orphaned (Jn 14:18ff), but rather has gone up to the Father for our advantage, so that we might be clothed with power from on high (Lk 24: 49) and be united to Him through the gift of the Holy Spirit. And all of this He does, not because of any merit of our own, but because of His gracious and merciful love for us; not for His own profit, but for our sanctification. Jesus is taken up into Heaven so that He might return to take us up with Him and share with us fully the glory that He has in the presence of the Father. And so, my brothers and sister, you can begin to see now why the Solemnity of the Ascension is an important event in the life of Christ and of the Church: it further demonstrates His love for us, and continues His mission to draw us all to the Father for our salvation. As we rejoice in this great gift today, may we open wide our hearts to the Lord, asking Him to make room in us for the gift of the Holy Spirit, to draw us more closely to Himself, to conform us more perfectly to His image and likeness, and to enkindle in us the fire of His love, for our sanctification and the salvation of the whole world. Amen. “Nativity”, by Giotto. ca. 1311-1320. Every year, on this day, churches are full, sometimes overflowing, with so many people. Why? Because our hearts are filled with joy! Children understand this very well. Ask any child about Christmas and they almost leap for joy and excitement, and wait for it with great anticipation. Given the freedom, I think many would give gifts to anyone they could. And this spirit of innocence and joy is contagious. Parents delight in watching the joy, excitement, and awe that their children feel when they open their gifts and play with their toys. But, as you know, it’s not about the gifts. We don’t rejoice because of the gifts. Rather, the gifts symbolise our joy. We rejoice because of the Gift, the gift that God has given of Himself in His Son, and the love that He’s shown us through Him. In the darkness of our lives, of sin and suffering, God has come down to us to bring us light and consolation, to bring us hope and salvation. God has come to us to bring us forgiveness and life. This is our joy! This is the cause for our hope! God hasn’t forsaken His people but has lowered Himself to become one of them to lead them from captivity into freedom, from death into life. God loves us too much to leave us in our sin and darkness; He Himself has come to get us. This is His great act of mercy! In the birth of Jesus, the doors of mercy have been opened! This is why we rejoice. And what joy this Gift brings! We’re no longer under the shadow of evil, but in the light of love, God’s love. And this is what brings us together to celebrate and rejoice in this gift. Now there is hope for the sinner; now there is life for those who are dead in spirit; now there is faith for those who suffer. This is God’s great gift of Himself to us. This is what we symbolise by giving gifts and lighting lights. We need no longer fear the darkness of sin and death; God has come to set us free. God has revealed Himself to us; He’s shown us His face, and it’s a face of love and mercy; a face that heals and that forgives; a face that brings us light and joy. And not just for a day, or even a season, but for eternity! By entering into time, by become a man, God has forever changed us; nothing has ever been the same. By taking up flesh, God has married Himself to humanity in a Marriage that can never be undone. And He does this not with power and intimidation, but with gentleness and humility, with weakness and vulnerability. The Almighty has become a little child, weak and poor, completely dependant on His mother and father. He’ll experience fear, temptation, suffering, pain, and even death. And all of this for us! All of this because of His love for us, and for our salvation. This love, this mercy, that God has shown us in becoming man, this is the light that He brings into our darkness. It’s no accident that Jesus was born in the middle of winter, in the darkest time of the year. When all of creation lies in the death of winter, God has come to bring life. Jesus gives us this life by the gift of Himself: a gift that began in a manger and found its fulfilment on the Cross; a gift that He continues to share with us today through the Sacraments — most especially in Confession and the Eucharist. And He continues to give us this gift of Himself so that He might be born in us; so that in us, He may once again be made visible. When we receive Jesus in the Sacraments, our hearts are changed, our souls are healed, and His light once again shines in us so that God’s love and mercy may be made visible through us. Celebrating Christmas, then, isn’t just about an event that took place two thousand years ago that changed the course of history. It’s about celebrating an event that’s still taking place; an event that’s still transforming humanity and all of creation; an event that continues to scatter our darkness so that we might live in the light of God’s love. And so, as we gather today to rejoice in the gift of the birth of the Child Jesus, may we open wide our hearts to receive this Gift of gifts, this gift of love and mercy, allowing Jesus to shine within the depths of our being so that we might be transformed into a new people, a people who live in the Light of God, a people who live according to the love of God, a people who live as a light for the world, helping others to encounter the love and mercy that God has brought into our lives. May we always seek — especially in this Jubilee Year of Mercy — to be children of the light in the midst of a dark world that so desperately needs to hear and experience the love and the mercy of God. Through Mary and her intercession, may God be with us; may Jesus be birthed in us, so that our lost and suffering world might come to know the joy and hope of His love and mercy. Amen. Ps 90 R/. Fill us with your love. O Lord, that we may rejoice and be glad. Today’s Gospel passage ties well to our Gospel from a couple weeks ago, about cutting off that which leads us to sin, but it takes a slightly different approach. It’s a simple and short story, a very human story, but it’s also very profound and moving. For me, it’s one of the sad moments in the Gospels. Here’s a young man, who by all accounts was a good man: he sought to please God, followed well the Commandments and sought to do good, and earnestly desired eternal life. He wouldn’t have asked the question if he weren’t genuinely interested in holiness. And he demonstrates this thirst for holiness by asking what more he could do, what he still lacked. He knew that even though he was living a good life, he wasn’t yet holy. And his question also tells us that he knew he was capable of doing more. He did indeed thirst for holiness, for righteousness, for spiritual perfection. That’s why I think we can so easily identify ourselves with him. And Jesus saw this willingness in him, that’s why He loved him (v. 21), and offered him what his heart desired. The spirit indeed is willing, but the flesh is weak (Mt 26:41). How it must have saddened Jesus that the young man turned away. If only he’d known that God wouldn’t ask more than we can handle; that He would’ve been there to help him; that He would’ve fulfilled his every desire a hundredfold and that he would indeed inherit eternal life. If only the young man would’ve stayed a few minutes longer, he could’ve heard about the riches he would’ve received for his sacrifice of love. Who knows, maybe he would’ve been an Apostle. But instead, he only heard that he’d have to give up his material wealth, that treasure which moth and rust consume (cf. Mt 6:19). He saw the pearl in the field, but didn’t see its value; the one he held in his pocket seemed bigger to him. How it must have saddened Jesus that the young man turned away. Many have accepted Jesus’ invitation to follow Him, to become His disciples; but many, because of their selfishness and materialism, have also gone away grieving (v. 22). And what grief it must be! Because the rich young man’s heart was divided: he desired eternal life, but his desire for his riches was stronger. His heart was indeed with his treasure (cf. Lk 12:34). How many times do we do the same? But only in God do we find peace, joy, and life. As disciples, we’re all called to let go of our material possessions, of our earthly desires, so as to be free to follow Christ and seek holiness. It’s not that riches are bad in themselves; it’s our attachment to them that’s sinful, because such attachments are egocentric: they’re an obstacle to love; an obstacle to following Christ. But all of us are called to be ready to sacrifice all things for the sake Christ, for the sake of eternal life. Whether Jesus asks this of us or not is a whole other question, but we need to be ready and willing to do so if He does. This is part of what is means to take up our cross (cf. Lk 9:23). 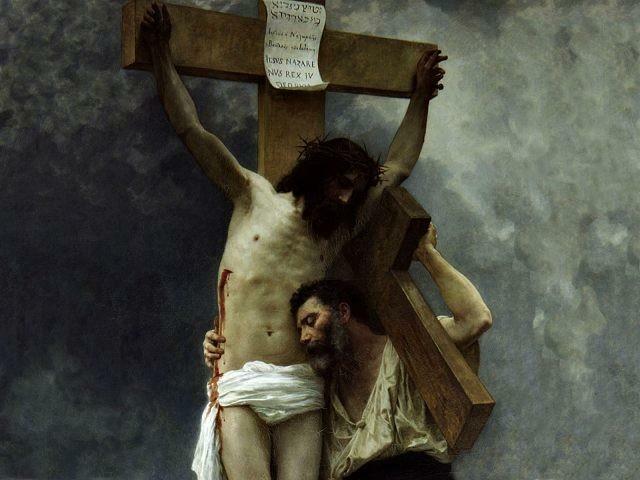 As the Catechism of the Catholic Church states, The way of perfection passes by way of the Cross. There is no holiness without renunciation and spiritual battle (no. 2015). This is a normal part of our life in Christ. There should be nothing more important to us than our salvation, because in the end, it’s either eternal life or eternal damnation — there’s no other option. So let’s place ourselves in the shoes of the rich young man: What is God asking of me? Where is He asking me to go in my spiritual life? What’s my next step toward holiness? Is there anything holding me back? Do I have attachments I need to let go of in order to follow Christ more closely? These are questions need to be constantly in our hearts and minds, because they help us discern God’s will, and they help purify our desires. And then we need to pray more, asking God to help us embrace this invitation, to help us say ‘yes’ to Jesus Christ, and to boldly follow Him, letting go of anything that keeps us away from Him. And so personal prayer and the Sacraments — especially Confession and the Eucharist — are key tools in our spiritual life. Jesus gave Himself to us completely and without reservation, and He asks us to give ourselves to Him in return, completely and without reservation. This is the mutual exchange of love, the divine Marriage to which He calls us, and He won’t settle for less! The call of the rich young man was an invitation to be united to the Saviour, to be conformed more perfectly to the image and likeness of Christ. Jesus makes that same invitation to each one of us: may we not turn away from it like the rich young man, but instead trust in God, and not let anything distract us from eternal life. And since October is the month of the Rosary, may we entrust ourselves to our Blessed Mother, asking her to guide us along this path to eternal life; to say ‘yes’ to Jesus with our whole heart, with our whole life Amen. Ps 32: 1-2, 5, 11 R/. You are my refuge, Lord; with deliverance you surround me. Our Gospel passage for today may well be short, but it’s really quite packed with content. If we take a closer look at it, we can see four different movements that take place: first, the leper begs Jesus for help; second, Jesus heals him; third, Jesus sends him to the priest; and fourth, the healed leper proclaims his good news freely. Mark is intentional in these different movements, because they’re an important part of the message he’s trying to share with us. That’s because the story of the leper is our story! If we go back to the first reading: for the Jewish community, a leper was considered sick beyond hope, and for the health and safety of others, a leper couldn’t live with the rest of the community. Lepers were to be banished. That’s what it meant for a Jewish person to be unclean; they couldn’t participate in the social and religious life of the community. As I said, the leper’s story is our story, because each one of us, as a consequence of our sins, has been banished from the Kingdom, from God’s community; sin has made us unclean. But our uncleanliness isn’t a hopeless one like that of the Jewish lepers, because we have access to Jesus, who can heal us. You see, if you remember, in the Gospel of Luke, Jesus began His ministry by reading a passage from the Book of the Prophet Isaiah and applying it to His life and ministry. He said: The Spirit of the Lord is upon me, because he has anointed me to bring good news to the poor. He has sent me to proclaim release to the captives and recovery of sight to the blind, to let the oppressed go free (Lk 4:18). Jesus came to set us free! He came that we might have life and have it in abundance (cf. Jn 10:10). It’s this gift of abundant life that He shared with the leper in today’s Gospel, and it’s this same gift that He so deeply desires to share with each one of us! So how can we have access to this gift? Well, here’s why the rest of the story is important. 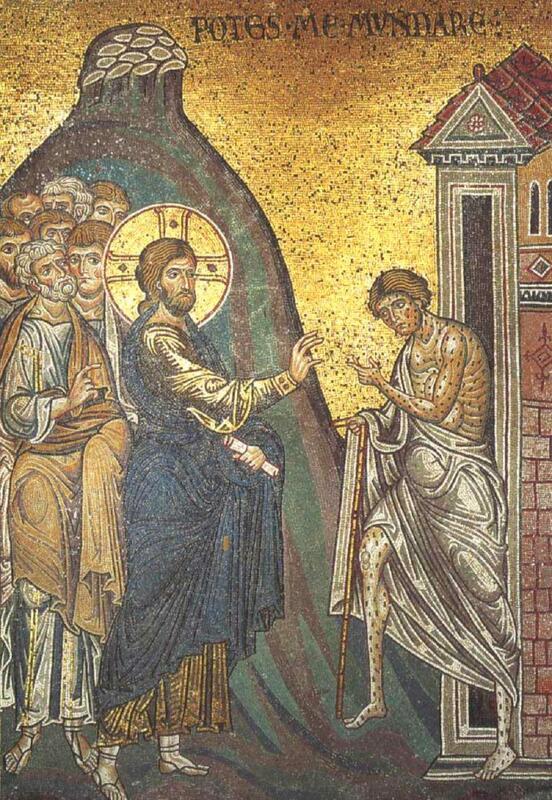 First, like the leper, we must ask Jesus to heal us, to free us, to give us new life. Jesus said: Behold! I am standing at the door, knocking (Rev 3:20). He’s right there, waiting for us to open up to Him and invite Him in. Jesus, if you choose, you can make me clean (Mk 1:40). And we know from this Gospel passage and from the Cross, that Jesus doesn’t hesitate to choose to heal us when we give ourselves to Him and trust in His love and mercy. That’s the second movement. In the third movement, Mark tells us that Jesus sent the healed leper to the priest. This is how Mark shows that Jesus obeyed the Law from the first Reading, and even worked within it. Jesus continues to work in this same way today in the Church. That’s why He gave Priests the power to forgive sins. And so in a sense, we can see in this passage a foreshadowing of Confession. And finally, in the fourth movement, the cleansed leper shares the joyful news of his healing with everyone. 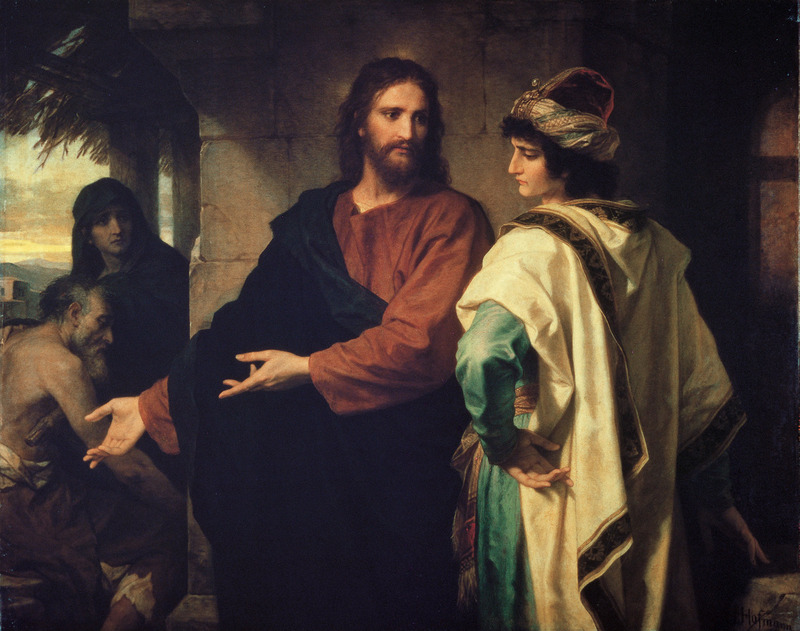 Now at first glance this appears to disobey what Jesus told him: say nothing to anyone, but go, show yourself to the priest (Mk 1:44). But I think that this is more related to Jesus’ respect of the Law, and that this command is linked to his visit to the priest. It’s not that Jesus doesn’t want the leper to proclaim the good news, but that Jesus desired him to give thanks to God for the cleansing before he begins to share the news (cf. Lk 17:11-19). This applies to us today, too. When Jesus heals us and frees us of our ‘leprosy’, we, too, need to humble ourselves before Him in thanksgiving before we go forth to share the joyful news with others. Because this healing is a gift of God’s mercy, a gift of His grace; one that we did nothing to merit, but that He freely gives out of love for us, and this love needs to be acknowledged first. But, after giving thanks, we must go out and share with others the joy of our salvation. Being healed and freed by God is definitely Good News, and it should be shared with conviction and zeal. This is our mission as Christians; this is our mission as a people healed by God through the waters of Baptism. That’s why the dismissal at the end of Mass always has some form of ‘Go forth’, because we’re called to go out and proclaim the Good News of our salvation to the ends of the earth, so that others might come to know the healing love of Christ Jesus. Jesus came to heal and save all people, and He’s chosen to include us in this mission; may we, by His grace, joyfully and faithfully carry it out. Amen. Ps 33 R/. Let your love be upon us, Lord, even as we hope in you. My brothers and sisters, today’s Gospel passage is a challenging one that hits to the core of Christianity, as Jesus’ words from the Last Supper echo in our hearts. Jesus is the Way, the Truth and the Life, and by no other name is there salvation. As Peter himself preached, There is salvation in no one else, for there is no other name under heaven given among mortals by which we must be saved (Acts 4:12). My brothers and sisters, Jesus isn’t ‘some other nice guy who teaches nice things’; He isn’t just ‘another prophet’ among many, nor is He just ‘one way’ to find God: Jesus is the only way to find God. He is the cornerstone upon which is built not only our Faith, but the whole of creation (cf. 1 Pet 2:6-8). No one else has come from the Father; no one else has revealed the Father to us; no one else has died for our sins or is risen from the dead; our salvation, our faith, our hope rest on Him, and on His union with the Father (cf. Jn 14:9-11). I am the way: Jesus is the Way to the Father, and His Way is the Cross. That means that to be disciples of Jesus we, too, must do battle against sin and temptation; we must persevere in carrying the crosses of our lives, and mustn’t despair or lose heart: Do not let your hearts be troubled, said Jesus, Believe in God, believe also in me (Jn 14:1). My brothers and sisters, we’re not alone in carrying our crosses: Jesus is there with us in each moment of suffering, in each moment of temptation, waiting for us to hand Him our crosses. Just as Jesus had the help of Simon on the Way of the Cross, so too, we have Jesus who will carry our crosses; we only need to let Him do it. We need to resist the temptation to do it all by ourselves, because the truth is we can’t. Evil, temptations, sin, death…, they’re all bigger than us; we cannot defeat them. But Jesus already has! We need only allow Him to make His victory alive in us. That’s why we must constantly get back up and turn to Jesus imploring His mercy. That’s why we must turn to Jesus in prayer, everyday (! ), to get to know Him and His Way. But to turn to Jesus means to follow Him: I am the truth, He said. The Way of Jesus is Truth, and it demands from us conversion: a conversion not merely of heart, but also of life. With Jesus, we cannot live like pagans; we cannot ‘believe’ in Jesus and then not try to live like Him; there’s no truth in that! Through Baptism, we’ve become a new creation (2 Cor 5:17), a chosen race, a royal priesthood, a holy nation, God’s own people, says St. Peter (1 Pet 2:9); we’ve been called out of darkness to live in Christ’s marvellous light (1 Pet 2:9)! That means, as St. Paul says, we must cast off the deeds of darkness (Rom 13:12). There’s no following Jesus if we’re not willing to change the way we live. But again, this is why we need to turn to Jesus in prayer everyday, because without Him we just can’t do it. Prayer helps us to better know Jesus, to grow in our love for Him, and it allows the Holy Spirit to show us what must change and to give us the courage to carry it out. And yes, that change is often painful, because we’ve grown attached to our sins and our way of life. But again, this is why Jesus’ Way is the Way of the Cross: we must put to death … whatever in [us] is earthly (Col 3:5), for if [we] live according to the flesh, [we] will die; but if by the Spirit [we] put to death the deeds of the body, [we] will live (Rom 8:13). And this, my brothers and sisters, is why Jesus is the Life! Because only through the Cross can we come to the Resurrection; only by carrying our crosses and turning to the Lord can we have eternal life; there is no other Way! This is what it means to believe in Jesus; this is what it means to allow the Holy Spirit to guide our hearts and lives into the communion of the Trinity, so that where Christ is, there we may be also (cf. Jn 14:3), not merely for a moment, but for all eternity. Let your love be upon us, then Lord, even as we hope in you (Psalm refrain); show yourself to us, Lord, so that, through you, we may come to the Father. Amen. Ps 51 R/. Have mercy, O Lord, for we have sinned. In the beginning, when God created man and woman, He created them to be in communion with Himself, and as we hear from the second creation account in Genesis, we notice that Adam and Eve walked with the Lord and talked with Him in the Garden; they lived in His presence, they lived in His peace. And they were able to do that because they were created in His image and likeness (cf. Gen 1:26-27). This image and likeness, this imago Dei (image of God), is what gave them the capacity to be in a personal relationship with God, and what differentiated them from all the other creatures created by God. Sadly, the imago Dei was distorted by sin when the serpent seduced Adam and Eve into eating the forbidden fruit. By being led into disobedience — which, in this context, I think, is quite severe since they were only given one commandment: not to eat of the tree of the knowledge of good and evil (Gen 2:17) —, by being led into disobedience, Adam and Eve turned away from God because they turned away from His will; they turned away from His Word. Now this isn’t some parental punishment for breaking the house rules! As if God said, ‘If you don’t obey my rules, you’re out!’. By disobeying the Word of God, by turning away from His commandment, Adam and Eve turned away from God Himself, because God identifies Himself with His Word; His Word is an extension of Himself. It isn’t like our words, which we formulate in our heads (hopefully!) and then speak with our mouths, releasing them to give joy, sadness or hurt. Once our words have been spoken, they’re no longer present, and they fade away. At best, our words create a memory; at worst, a wound; either way, they’re gone. God said, ‘Let there be light’; and there was light. And God said, ‘Let the waters under the sky be gathered together into one place, and let the dry land appear.’ And it was so. And God said, … ‘Let the earth bring forth living creatures of every kind… And it was so. Then God said, ‘Let us make humankind in our image, according to our likeness… And it was so (Gen 1:1-26). And again in the Psalms: By His word the heavens were made, by the breath of his mouth all the stars (Ps 33:6). God’s Word is alive and active (Heb 4:12): it doesn’t fade away like ours, rather it lives and it brings into being, and because it lives in God, it’s eternal like Him — Heaven and earth will pass away, but my words will not pass away, says Jesus (Mt 24:35). And St. Peter said, ‘[T]he word of the Lord endures for ever’, and that living and abiding word of God … is the good news that was announced to you (see 1 Pt 1:23-25). So what is this good news that was announced to us? St. John tells us: We declare to you what was from the beginning, what we have heard, what we have seen with our eyes, what we have looked at and touched with our hands (I Jn 1:1). And what was from the beginning? In the beginning was the Word, and the Word was with God, and the Word was God. He was in the beginning with God. All things came into being through him, and without him not one thing came into being. […] And the Word became flesh and lived among us (Jn 1:1-3, 14). Jesus, Jesus is the Word of God (! ), the eternal and creative Word made flesh. What we’ve come to call the written Word of God, Scripture, is the revelation of Jesus Christ. Scripture is the Word of God made known to humanity, which reveals to us the Word of God, Jesus Christ, and the actions of the Trinity. God reveals Himself to us through His Word, and He transmits Himself to us through His Word. That’s why to reject the Word of God is to reject God Himself, because, for God there is no distinction between Himself and His Word, they are One: The Father and I are one, said Jesus (Jn 10:30). But that’s what Adam and Eve did in the Garden: when they turned away from God’s one commandment, when they turned away from His Word, they turned away from Him. But notice how Jesus, while being tempted in the desert, responded to the devil by quoting Scripture. As the second reading tells us, we received the free gift of salvation through the obedience of Jesus. And Jesus came to reconcile us to the Father, to restore in us the imago Dei that Adam and Eve had distorted. By the obedience of Christ we are saved! Jesus restores us to obedience, through Himself, by being obedient to the Word of God; this is why He quotes Scripture to turn the devil away. Three times the devil tries to lure Him into sin, and he even tries to use Scripture against Jesus: If you are the Son of God, throw yourself down; for it is written… (Mt 4:6). But Jesus was able to avoid this manipulation because He knew the Word of God in His heart: He understood the Word of God, because He Himself is the Word of God. My brothers and sisters, we too, need to come to know the Word of God in our hearts, because the Word of God leads us to the Father, teaches us Truth, feeds our soul, and strengthens us against temptation. Because the Word of God reveals God to us, and because we’re created in His image and likeness and given the command to be perfect as the heavenly Father is perfect (Mt 5:48; cf. Lev 20:7), we necessarily need to come to know who God is, and how we’re to imitate Him. This way, Jesus will abide in us, and we will be one with Him, and through Him, one with the Father and the Spirit (cf. Jn 17:21). Just as Jesus, the Word made flesh is the Bread of Life in the Eucharist, so too, is Scripture, the Word of God, food for us. May we feast on this food, and come to meet and know the God who loves us, the God who saves us, the God who calls us to imitate Him, the God who calls us to be one with Him. And may our meditation upon the creative Word of God recreate us in His image and likeness. Amen.